This is a question I hear often and it is has an important answer. There seems to be a lot of confusion when it comes to Fall /Winter trimming and I know from my own experience that most trimming done in the Fall/Winter is not done for the right reason. Landscape companies have little work off-season, so they want to convince you that you need to cut back and mulch in the fall/winter months. While the mulching part is accurate the trimming part is simply not true. I have been doing gardening/landscaping both professionally and personally for over 20 years in Central Texas and I can tell you most fall trimming is a bad idea. The only reason you would trim deciduous perennials (returning plants that go dormant in the Winter) in the fall is for aesthetics, for example, most commercial properties and HOA’s do not leave dying leaves and plants untrimmed over this season for visual reasons only, it’s not done for the health of the plant. Of course evergreen shrubs that are intended to have a shape can be trimmed all year as needed, but if they are a flowering evergreen shrub, late fall/winter trimming is discouraged to avoid the loss of spring flowers. The healthiest way to go about it is to embrace the winter landscape and allow the plants to hold onto their dead leaves and branches for protection from the harsh weather. If you have lived in Austin Texas for more than a day, you probably know we can go from summer to winter and back again in less than 24 hours, it is hard enough for us to figure it out, imagine how your plants feel. Trimming your flowering perennials encourages new growth so you may be encouraging your plant to grow back too soon during a warm spell. Wait until the early Spring when you see the first signs of green and trim back then. Keep a garden journal identifying each plant so you remember where dormant plants were and you know which plants not to trim at all. Most woody plants need nothing trimmed but the very ends but you wont know that if you do not allow them to green up first. This tree split due to the burden of weight distribution, best to have one main trunk with branches coming off of it. Roses should be trimmed and dead headed all year as needed, but winter is a great time to do your hard pruning, (January is best.) 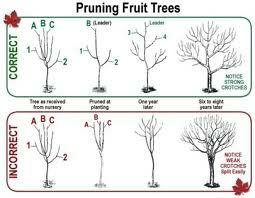 Hard pruning helps stimulate a strong root system and stimulate the new Spring growth. This is again a case when pruning too late will mean you have cut off the buds for the spring season. Most roses will tolerate a pretty significant cut back and this is the time to cut out all the dead and overgrown wood. 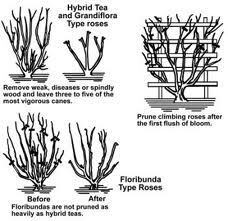 Hard pruning Climbing Roses can kill them so only cut the dead wood and leggy branches from them. If they are terribly overgrown, only cutback to about 4′ or so, never to the ground. If your roses have black spot or fungal issues, carry a plastic bag with you to collect the leaves and clean up around the ground being careful to remove all diseased leaves, bag them and throw them into the garbage so they are not spreading on next year. Tree “suckers” are the little stems that sneak out on the trunk of the tree. 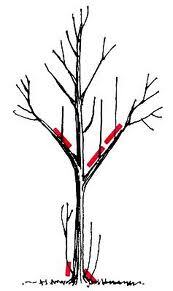 Remove those as they drain from the tree and serve no purpose. 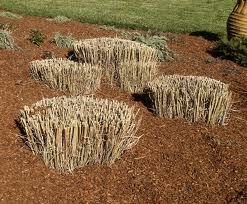 One of the tricky plants to trim is ornamental grass. Grass need to be trimmed after they turn brown, You cut them back into a bun shape after they turn completely Brown but before they start to send out new green blades. Cutting the dead material back allows the new blades to penetrate the dead blades and reach for the sunlight. Cutting back too late can cause a separation of the new blades creating large empty spaces in your large ornamental grasses and those dead centers will not fill in leaving the grass looking sparse and frankly rather unattractive. Ornamental grass grow from 6″ to 12′ tall and you need to be especially careful with certain ornamental grass as some of the blades are as sharp as a razor if you rub them the wrong way ( sort of like some people we know 😉 Always wear protective gloves and long sleeves when cutting back your tall grasses. ← Is Your Landscape Playing Well With Others? This is an oldie but a goodie. Be sure you are trimming for the right reasons at the right time.